don't you just love your name in print? even if it's just on your own stationery! this picture shows a big part of what i do--personalized notes. these are what i found on my desk and in my files today with my own name. some i print for myself as i create new designs, others are left over space on the page as i lay out someone else's design. as you can see, i'm never far from a piece of paper with my name on it! friends & potential customers often ask: can i see your work online? and so this blog was born. 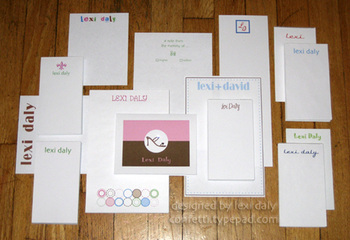 my main goal here is to have an online portfolio of that work--notepads, stationery, invitations, party ideas, etc. some of my designs are simple font and color layouts or designed completely on my computer like the notes above. for others, i turn to my massive collection of stamping and paper crafting supplies that beg to be used and offer elements of surprise and textural detail. if you want to see more, check out the photo albums on the left--once you choose an album, click on a thumbnail to get a closer look and scroll through each picture in the album. descriptions are included below each picture. i continue to add new photos as i complete projects in addition to old favorites as i have time to photograph them. if you see something you like, i can create it for you or i can design something brand new--just email me! some of you have likely found your way here following links on other stampers' blogs or in my signature on scs. since stamping is my first passion, you'll see a lot of that here! i stamp whenever i can in my work, but i also try to make time to stamp for myself. i hope to post samples fairly regularly. i get so much inspiration blog-hopping and want to contribute my point of view in hopes of inspiring someone else in return. so far, i can't seem to post daily--in the future, who knows! enjoy & come back again soon! i placed a picture in a post *and* created my first photo album! it's just the beginning of an album actually, with only a handful of miscellaneous stamped designs--but it's ready over there on the left. 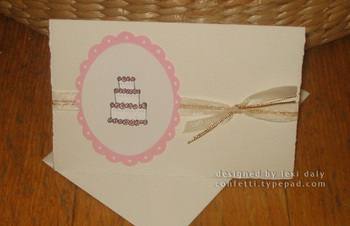 this gift card is included--a simple and elegant card for a shower gift--quick too! the cake is paper source and the punches, must-have marvys. more albums and samples will follow soon! a place to post my creations and ideas on the web! this blog will mainly be an online portfolio of sorts, including photos of current work plus old favorites. i'll probably throw in a few family shots here and there as well!